Now that GTA 5 has made it to PC at long (long, long) last, many players are finding that the port was worth the wait. The game runs fantastically well and seems to be the culmination of everything Rockstar has learned since the original launch of the title back on last-gen consoles and the new-gen re-release since. What’s really happened, however, is that Grand Theft Auto has given players their biggest, most fleshed-out open world playground since The Elder Scrolls: Skyrim, which remains a PC favorite to this day. Obviously, the two settings couldn’t be more disparate. One is a fantasy landscape of swords, sorcery and dragons, the other is a modern day parody of southern California focused on crime, corruption and shootouts with gang members and cops alike. But both share a common achievement, as each has arguably the most in-depth open world of their era. But one thing could be standing in GTA’s way, something that could prevent it from having the kind of longevity as Skyrim. The seeming reluctance of Rockstar to support mods. Skyrim, as a vanilla game, already comes baked in with potentially hundreds of hours of exploration. But the game has really thrived throughout the past few years because of an enormous modding community that has refined, tweaked or outright broken the game in every way imaginable. There are mods to allow you to see the individual fibers of fabric on a tunic, and there are mods that allow you to replace all dragons in the game with Thomas the Tank engine. The spectrum is wide, and it is true definition of a sandbox where anything is possible. GTA 5 certainly allows players to explore the countryside, but you won’t stumble into the sort of bottomless dungeons you can encounter in Skyrim, nor will you create a dozen different characters with different specialties. 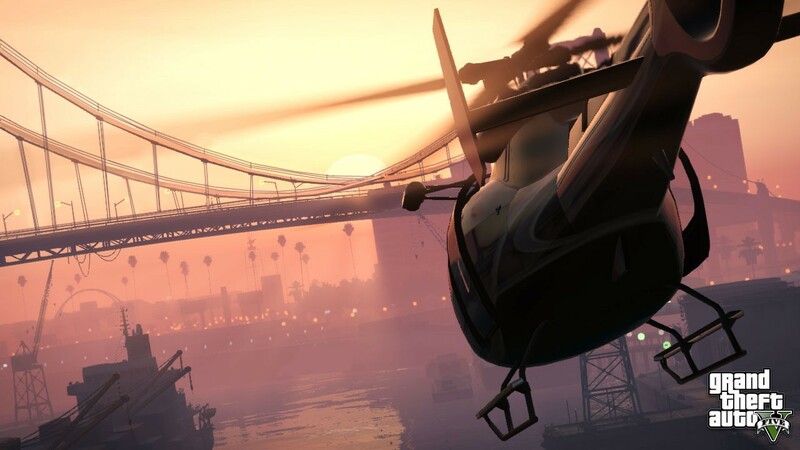 Rather, Rockstar wants to herd players into an alternate sort of endgame, GTA Online. It’s been around since the launch on consoles, but after a rocky start involving a number of exploits, followed by nearly eternal silence about online heists, it finally seems ready for primetime as a mini-MMO with reach on PCs the world over now. It’s not just Rockstar’s goal to keep players engaged until the inevitable release of GTA 6 a few years down the line, but they want it to be a persistent moneymaking vehicle for them, as the mode allows players to purchase game cash for real cash, and blow it on everything from weapons to clothes to real estate. It’s a little like The Sims, with a lot more death and destruction. Modding took off for GTA IV PC. What are you doing to support modding for V? Is there anything within the game that supports it? And…that’s it. It’s a rather brusque response to arguably the thing the community is most interested in when it comes to the PC release of the game. GTA IV had some truly incredible mods, and again, huge sandbox games like Skyrim achieve utter immortality through mods, and in that case Bethesda handed players the tools to get started. Rockstar wants you to play in its sandbox, but first and foremost using their rigid set of rules. I understand the impulse to protect players from online-invading mods that make GTA Online unplayable, but down the line, once things get settled, hopefully Rockstar comes around and offers the game the full mod support it deserves. It’s not as if mods won’t exist for the game regardless of what Rockstar does. The technically talented are already crafting simple mods for the game like FOV sliders and infinite ammo/no death cheats. But so far, response from a few figures in the dedicated modding community has been somewhat pessimistic, as Kotaku reports. Hopefully there’s a middleground here. One where players who want everything on the level can play GTA Online as it was intended. And another where there’s an “anything goes” zone where players can go as crazy as they want to modifying Los Santos and its surrounding countryside. Hopefully someone is drafting a mod as we speak that replaces all police cars with Thomas the Tank engine.